dutchman said: I'm pretty certain this is the junction of Bishop Street and Castle Street not Corporation Street as stated in the caption. Yes, it's definitely not Corporation Street, or else we would be looking towards the Hales Street/Burges corner - which is certainly isn't. However, from a 1937 map that I've just looked at, Castle Street doesn't meet up with Bishop Street, and the slope of the road suggests that we're looking westwards, so I wonder if it could be King Street? I've used this photo below on my 'now and then' section, and the building on the corner does sort of match. Of course Rob, it's the Castle Hotel (actually a pub) on the corner of King Street and Bishop Street. Great work guys, that photo is so teasing - as per my earlier thread I'm desperate for a decent shot of the Turks Head down there in Silver Street - my grandad's pub! What a great view of Holy Trinity the policeman has! It's a pleasure Neil. I've always loved that view down Bishop Street in old pictures, the modern view doesn't have quite the same magic though, does it! Too right Rob - was it really war damage that took so many of those buildings in that shot? There's barely nothing left today from that? From what I can gather, it sounds like Bishop Street was very badly hit in the war, although all I have to go by really is a small number of photographs, like on this page... http://www.historiccoventry.co.uk/nowandthen/content.php?pg=bishop-st-po and Norman Cohen's reminiscences, on this page.... http://www.historiccoventry.co.uk/memories/content.php?pg=cohen-n It's sadly obvious that no post-war town planners have given any time or thought to this once historic street - and that, even more sadly, includes the Old Grammar School at the bottom. That ancient place is probably worth a topic of its own - what should be done with that old building? NeilsYard said: Too right Rob - was it really war damage that took so many of those buildings in that shot? There's barely nothing left today from that? The former mediaeval suburb of St Nicholas just above Bishop Street was badly bombed during the war and the remainder cleared for the building of the ring road. The Castle Hotel survived the war but was knocked down shortly after completion of that section of the ring road circa 1960. I think the roofline to the right below what Dutchman says is the Opera House would be Silver Street. Seems that patch has been scrub-land for a while then! You and Dutchman are spot on, Neil. 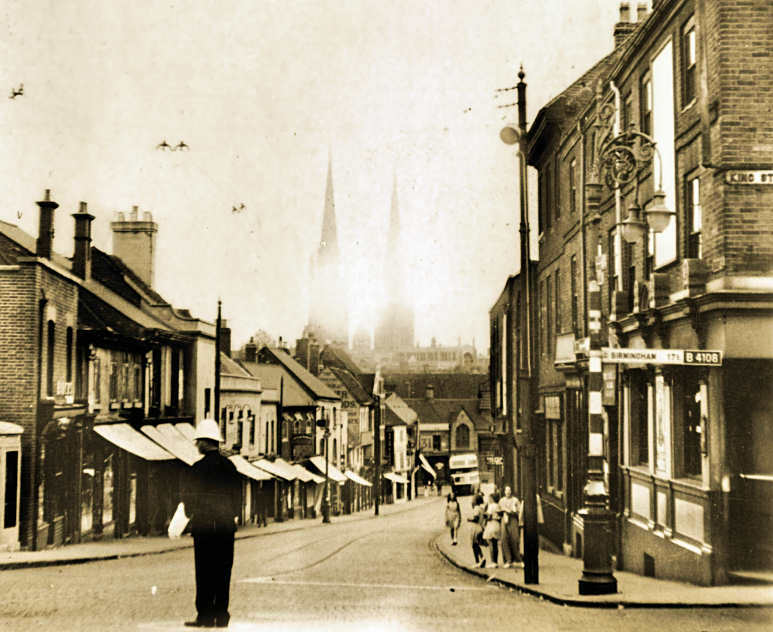 I've put below a close-up of the original photo I used for this Now and then page, which more clearly gives away the position of the featured buildings in the above photo, with Silver Street in the background. On 10th Jun 2013 7:38am, Foxcote said: I wonder what the 'Peeping Tom' sold? I think the driving school I went to in the 1960's was in one of those buildings. On 10th Jun 2013 7:56pm, dutchman said: I sincerely hope it wasn't the optician's Anne? Could have been, it took me long enough to take my test! No, it was a bit further up the street, the cars were parked in a cul-de-sac behind the shop. There was also a hairdresser Arthur Evans, Tooby Adkins shoe repairer with large pieces of leather in the window, a cycle shop where my dad bought me my first tricycle, and when I was at an age to be courting a dancing school which I think was the Star Studio Stage school. At a later date in the late fifties there was a gents hairdressers about two/three shops up from Silver St where I had my hair cut the day before I got married.